16 seasons is a long NBA career, but it will never be enough Manu. After being a Spurs fan marooned in Los Angeles for years, I finally made it to a Spurs home game in March 2016. I had decided earlier that season that it might be the Great Tim Duncan’s last year. This gave me the incentive to invest the time and money to fly to San Antonio with super-wife Linda for a stay on the Riverwalk and a Spurs home game – against the Sacramento Kings. Ironically, Coach Pop decided that for the game we chose — a late-season game against the Sacramento — he did not need Timmy to play for the Spurs to win. Of course, we only learned of that as we walked into the arena and saw Duncan in jeans and a sports coat on the bench. So it was a TD — DNP (Coach’s Decision) for Linda and me. But the night was memorable nonetheless. A month earlier, My Man Manu had suffered the Injury That Will Not Be Named (an injury to the man region) while taking a charge for the millionth time in his career (stats not official). Since no one had dealt with such an injury before, no one could predict the recovery time either. 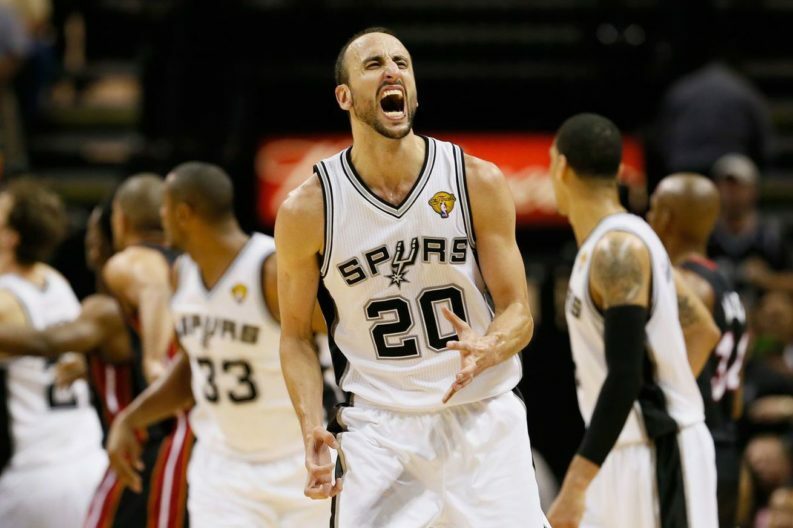 Luckily for us, Manu Ginobili chose our first trip to San Antonio to make his return. When he checked into the game late in the first quarter (off the bench, of course), the crowd cheered loudly. Every male in the arena wondered whether they would have the…fortitude to come back so soon after The Injury. He did. What happened next made it especially amazing. Within the first few minutes after he checked into the game, Willie Causey-Stein of the Kings (7’0’’ and 240 pounds) drove to the hoop, slightly out of control. Manu stepped in and took the charge. KIRK: Spock, we need to shake things up for Game 5. SPOCK: Agreed, Captain. The Miami Heat scored more points than we did in Game 4. With all due respect, your strategy of allowing them to shoot wide-open shots proved to be unwise. MCCOY: Dammit, Spock, that strategy worked like a charm in Game 3. And they don’t even play basketball on Vulcan. SPOCK: Your insults have no place here, Doctor. And even though I have no feelings, I still feel a mild distress when I recall that Vulcan is now destroyed. KIRK: You know, my gut tells me we need to start Manu. It may be his last home game, and the crowd will get very emotional if we let him start. Bones, what do you think? MCCOY: Dammit, Jim, I am a doctor, not an assistant basketball coach. SPOCK: Captain, it would be illogical to start Mr. Ginobili. He is shooting 35%, averaging only 7.5324 points per game, and has more turnovers than rebounds. Frankly, starting a tribble would be more logical. MCCOY: Jim, I hate to say it, but old pointy ears is right this time. Manu’s game stinks so bad it would knock a buzzard off a crap wagon. KIRK: You are right about that. Bones, is Manu injured? MCCOY: Dammit, Jim, I am a doctor, not a… uh, actually, I can answer that. He’s fine. Just old. KIRK: Enough debate. I’m the captain; we are starting Manu. If it doesn’t work out, I will answer to Star Fleet. SCOTTIE (over the intercom): Captain, you need to get down to engineering! Danny Green is so hot the warp drive is about to blow! KIRK: Sorry, Scottie, nothing we can do. If we let Danny Green cool down, we don’t have a chance of making it. MCCOY: Jim you were right. Your gut instinct to start Manu worked out perfectly. Emotion overcame logic once again. What do you say now, you Vulcan robot? SPOCK: Doctor, your insults have no place here. I knew starting Mr. Ginobili was logical. I have now consulted the Corman Outcome Theory, and it proves the decision was logical – we prevailed. Indeed, because the Miami Heat had gone small, starting Mr. Ginobili meant the Heat had to try to cover him with Mike Miller, who hasn’t been able to play defense since the Empire was young. The logic is impeccable. KIRK: Mr. Spock, that is a reference to Star Wars, not Star Trek — And something else is bothering me. Bones, why is it that you spend all your time standing next to my captain’s chair picking fights with Spock? Shouldn’t you spend some time in sick bay, at least every once in a while? SCOTTIE (over the intercom): Captain! Danny Green is really hot now. I can’t keep the ship together much longer! One day during my senior year in high school, my physics teacher had us debate whether, with all the billions of humans on the planet, anyone ever had a thought that no one had ever thought of before. Looking back now on that question, I think I might have been the first and only person on Earth to decide that Manu’s remarkable Game Five in those Finals would be best described by a debate among Kirk, Spock and McCoy. ANSWER: No, my wife died last year. QUESTION: How long were you married? QUESTION: That’s a long time. My client’s answer encapsulates how I feel about Manu’s retirement. As great as it was to have Manu for 16 seasons, we did not have him long enough.